Lately I've been thinking (once again) about classifications and/or demographics for the magazine. A group of foragers were discussing general interest in wild foods, which led me to contribute my own answer - which included the term Backyard Herbalism. 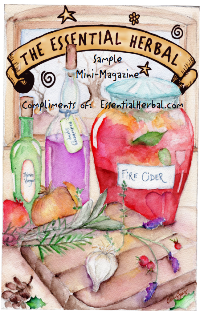 In the conversation, I said that most of the readers of The Essential Herbal Magazine are backyard herbalists. So... because words are fascinating to me, this exchange has had me going over this phrase in my mind, trying to decide exactly what that means - to me. The gentlemen in the group felt that men were much more interested, although Angie Goodloe and I both declared that we had an overwhelming number of women when we taught. The magazine is 95% or more women readers - not counting housemates - so I know they are also interested in the wild plants and weeds that grow outside our doors. ...what REALLY takes my breath away are the useful plants. The more useful, the more exciting! We are the ones out there in pinching the tops off the St John's Wort, kneeling in a patch of plantain, or lifting the leaves to check underneath for winter chickweed. Ask anyone who has been with me when a new and long-sought-after plant crosses my path, and they will tell you of the nearly embarrassing display of excitement that I am completely unable to conceal. 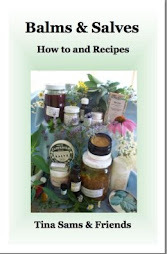 Backyard herbalists learn to make infused oils, vinegars, and tinctures. We dry the plants that we find and mix them into potions and lotions. We have a little something for just about anything that could come up. At the same time, we don't pretend to be doctors, and we don't presume to treat serious issues that need to be seen and evaluated by trained medical personnel. Some are highly trained, and may go a little further medicinally than I would. Oh, and I love my sack of cardamom seeds, and the bags of sandalwood, dragon's blood, and frankincense that I couldn't possibly have found in my yard or in my rambles. The exotic stuff is wonderful, so don't make me give it up! It's just that it is the icing on the cake, and the cake is made from ingredients I found outside. That's how I would identify a backyard herbalist. No Marthas here. Just tree-hugging, dirt worshipping hippies. And that's who is reading the magazine, too! My best friend is sad, and so I am too. The world looks like it is sad too. 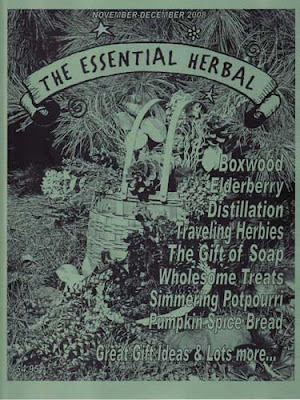 The Essential Herbal Nov/Dec 2008 issue is out! 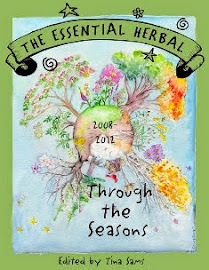 We're drawing a close to another year here at The Essential Herbal. Another year full of incredible information, people sharing their love of the plants and what they can do for us, stupendous recipes, ways of doing things... it just amazes me how much I keep learning. That makes 8 full years of continuous publication. Can you believe it? I look over the contributors we've had sharing with us this year, and am again amazed. Our regulars are terrific, and continue to come up with fascinating ideas for us. Additionally, I've asked subscribers on the magazine's yahoo group to send me notes of "what they want" in their herb magazine. They've sent in some really well thought out ideas and we will be putting some of them into place immediately. We've always tried to make sure there was enough in each issue that everyone would feel they had their money's worth, and I think we managed to do that. Now, with the country in the state it is in, we need to make doubly sure. 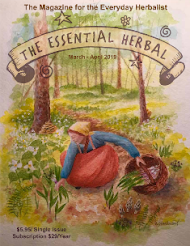 So... if you have a skill with herbs that you'd like to write about, we'd love to hear from you. If you think there is something we should be doing that we aren't, we'd like to hear about that too. We can't promise to do everything, but we can't try if we don't know. Of course, everyone likes to hear what they are doing right, and we aren't adverse to some encouragement :-). So here's the next issue. We think you're going to love it! List Article - What did you learn this year? A couple Far Out and Intense November classes!!! We’re pulling out the tie dye and dusting off the old Joni Mitchell albums to hang out with groovy guest teachers ‘The Twisted Sisters’: Tina Sams of The Essential Herbal and her sister Maryanne Schwartz of Lancaster County Soapworks, Etc. and Torchsong Studio. In the morning they’ll discuss the many different ways incense is made and burned and show us how to make incense cones using sandalwood and frankincense. You will take home your own hand-made cones and the knowledge needed to continue making your own incense for holiday gifts and home use. * Basic supplies for do-it-yourself will be available for purchase from Farm at Coventry on the day of class. Autumn Faire Pictures - Sonny and Andrea are engaged! Today we were summoned to the renaissance faire. It was a simply gorgeous day. The immense straw man greeted us as we entered, in stark contrast to the queen growing by the side of the mansion. Heh heh... I have gardening gloves just like the queen's! Our kids work there, and one of their best friends, Sonny, met his sweetheart there last year. Today he proposed to her on stage during the Queen's Court intro to the day. We were happy to go witness it. He did a fine job of it, too. Sonny approached the stage filled with confidence. We were all so happy when these two finally decided to stop the wild flirtation and finally date. They make a very sweet couple. They changed quickly and surely from 2 single people into a couple who are very much ready to make a life together. Andrea came forth, and Sonny gave her several dozen roses before dropping to one knee. He'd written what he wanted to say to her. I think the queen may have been in suspense, but how could any woman turn that down? Look at him! The ring was his grandmother's. And of course, she said yes. To my stunned surprise, I looked beside me to see my sister and daughter both in tears. I must be getting salty in my dodderage. For the past 10+ years since we sold our shop at the faire, visits have been a quick walk around the grounds and out. It hasn't been fun for my sister and me. Today was different. There were some beautiful things to see, some old friends to visit - although it was crowded so there wasn't much time to visit. Below you'll see some of the things that caught my eye. Our friend Fenris the potter is an artist in so many different mediums. These altars are his work and they are truly divine. A corner, almost out of sight held this vision. One of the celtic bands that took the stage today. These drummers were absolutely incredible and drove the crowd wild. The bag-piper held his own quite well too! The kids - Rob, Sonny, and Molly. Now for some reason THIS picture might make me tear up. They are all grown now. Seeing them in our old stomping grounds, forging (heh heh - little pun, sorry) their own way is odd. They relate in completely different ways to the things that we used to tell them about. It's just ...odd. The fountain in front of The Globe, dressed for Autumn. Another, more primal, straw man. Maryanne (normal) and the kids (who've been too long at the faire). The grounds of the shire were decorated to welcome the harvest more beautifully than they ever even came close to during our days there. We were very saddened to see that the giant ginkgo tree at the top of the hill was gone. On days like this, we'd look up and see the brilliant blue autumn sky (forever named "Emil blue" for Don Juan's shirt our first year there, which matched the sky, and Don Juan was portrayed by a gorgeous young man named Emil). The clear, pure yellow of the ginkgo leaves would contrast so strikingly with the sky that it would take our breath away. I just noticed it the other day, really. Of course the days are getting shorter, and the plants are getting tired of trying to look their best under these circumstances... especially considering that they've done their work for the year, setting seed and assuring the perpetuity of the species. Still, it comes as a bit of a shock the way Autumn is stealthily weaving her fingers around everything. The shrubs out in front are covered with spider webs, and when I saw it last week it struck me as odd because that happens when it is Fall. The wooley bear caterpillars are EVERYWHERE, and I remember thinking how early they are this year - hah. The corn and the soybean crops turned so dry so fast this year! Did we have a drought? It's too early for them to be done, isn't it? This danged fall is moving in fast! This morning I looked out the window, and there it was! Autumn was right outside. The sun hit the crest of trees on the other side of the pine trees at precisely the moment I first looked out the office window. Unfortunately this picture is a few moments later, when I'd found the camera and thrown on something that could go outside. So yeah, it's been getting autumnal around here, I suppose. Might as well face it. It's been incredibly busy. Perhaps that's how it happened... I mean, you'd think I would have noticed that the kid has been in school for a month and a half. But in my defense, let me give you a little bit of this week - just this week! First, the magazine was delivered on Monday, and I've been working away at that every chance I get, and finally took the bulk mail into the post office this morning. I got to see ALL the late night hosts Monday and Tuesday nights, determined to have it ready this morning. In the meantime, we've been taking sign-ups for the upcoming soap class - which is going to be incredible, btw. Yesterday I was just about to start down to Maryanne's to take a very large order to a new customer (easier to deliver than to pack!) and wrap another order, when she called to tell me there were cows in the yard. They'd escaped from the neighbors. There's a spot down by the creek where they can walk right through, but they only do it rarely. Bob was rounding them up with the 4 wheeler before I even set out, and even though I missed the cows, the ever multiplying flock of banty chickens was everywhere on the way down. They are always a distraction for me on the way down. So we went to the supply store this morning and found containers to hold the fats and lye for the class, and something that will work as a mold. Now to finish the DVD and get together a list of suppliers. We got home and whipped up 6 batches of soap and wrapped another order to go out tomorrow. Still working on another one too. Tonight I'll address the shops, writers, and advertisers copies while the presidential debate is on. Looking back, I think I can see where Autumn slipped in. In another week or so we'll be giving up Daylight Savings Time. That hour is so wonderful - I'll miss it. On the other hand, I had some of the best pumpkin pie that I've had in years today! It was from Bird-in-Hand Family Restaurant. If you're near, GET A SLICE!!! Sign up to learn to make cold processed soap here. Click on the "shop for products" button, and then follow the "classes" link to order. During the last week of October you will receive all materials required for a 2 pound batch of soap. 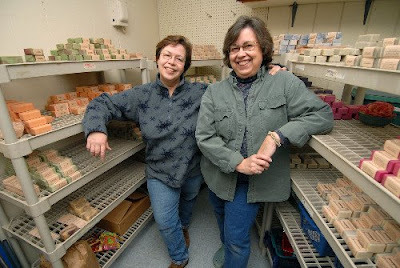 Inside, you'll find a DVD showing exactly how we make soap, how we store it, and a glimpse into how a mid-sized farm-based wholesale soap company operates. You will also have full instructions, recipes. During the first week of November, we will have a Yahoo group to discuss any problems or questions that come up. We will also offer sources for the ingredients so that you can continue making soap! Shipping is not included in the cost. On this past Sunday, Molly and I continued the quest for the perfect college. We went to look at Kutztown which is a mere hour and a half away. The campus is really breathtaking, and I decided that *I* would very much like to go there. Several people that I know through herbs claim Kutztown as their alma mater, and the work they do in preserving the PA Dutch heritage is substantial as well. Right away I began noticing the plantings, landscaping, and diverse varieties used. There were hundreds of species located on the grounds! You can imagine how exciting that was for me! We rounded a corner and found a greenhouse. Along side the greenhouse was a sort of abandoned (?) wild place full of tomato plants, beans, corn, and squash. I loved it. Really, inside I was thinking and trying to telepathically send to Molly, "go here! this is awesome!". We'll see. This plant forms a hedge near the building with the greenhouse. The hedge was slightly higher than 6' and wound up to the next building. The leaves remind me of chesnut leaves, but the nut/fruit (about 2" in diameter) is shaped differently. The outer coating is very much like the black walnut, but black walnuts don't have that drooping shape away from the stem. I'm mystified. Anyone know what it is? Make an old woman happy and write in. As we set off for home, we intentionally got lost on one of the country roads surrounding the college, first checking out the festival grounds where the folk festival is held, and the heritage homestead (I forget what it is called at the moment) with the one room schoolhouse, house, barn, etc. Within a mile of the school, we found ourselves on a winding 1.5 lane blacktop road with a wide and shallow creek running next to the road. It followed us for miles, taunting us with nowhere to pull over. Finally we found a place. As we drove along, the canopy overhead showed us that autumn is indeed on the way. Yellow leaves danced across the road ahead of us, corn fields are dry and skeletal, and most fields have been mowed, tilled, or in some way tucked in for winter. As we rounded a curve, I caught a glimpse of my old friends, the wild turkeys, out of the corner of my eye. They had a third, but she scurried into the brush. Camera shy, you know. I am very superstitious about wild turkeys. Can't help it. If you know me or have been reading along, you probably know that wild turkeys (really wild, not the ones we have here, apparently - lol) seem to show up just before a big change of some kind comes up. Usually it is something wonderful. The first time it was to tell me Molly was on the way. The next time I saw them was on the way to look at our shop with a realtor. Later, a momma and baby turkey told me it was time to get the heck out of Virginia, and a couple of years later I saw one a few days before meeting the man who has been in my life for the last 6 years. There weren't any other turkey sightings. That was it. So now I just have to wait and see! .... I got a surprise in the mail. Yep, that's right. In the mail! I'm still catching up with things that I meant to blog. It was more than a month ago. I was feeling a little down, and Laura & Robbie leapt to give me a nudge towards the lighter side of life. The chocolates have now disappeared and I can start in on salads and fruit, etc to try to remove them from my well padded bod. As the darkness fell, the scent of the open flowers was startlingly beautiful, but fleeting. You catch just a whiff, and then if you try to get more, it is hard to find again. Now they are gone and the seed pods are forming. ...would be a wholesale tradeshow. We've always talked about doing something, but avoided it because it seemed a little out of our league. It felt a bit like kismet to be invited to participate in a smallish tradeshow that caters to "our" crowd, in a venue we never even knew existed! So for 2 days we talked about my sister's products and her wholesale policies and specials. It was really a lot of fun and not nearly as exhausting as retail sales (isn't that always the case when discussing wholesale vs. retail?). Here is the display we put together. It is simple and utilitarian. We didn't want to spend a lot of money when we didn't know what we were getting into, and although it looks a little sparse in this photo, it worked very well at the show. We handed out tons of samples and got some nice new wholesale accounts. The orders are nearly all filled, packed, and ready to ship! Bottom line? We can do wholesale tradeshows :-). Organic Mechanic Soil. Mark was a very pleasant neighbor, but more than that he was interesting to talk to. He is very passionate about what he does, in fact he is quite possibly the only person I've ever heard say, "I've always loved compost." Beyond that, he filled me in on the problem of worms changing the soil composition of the old forests in MN, and I listened to him explaining his product to customers. He's an impressive guy who walks the walk - even bringing his own mug along for the beverages provided by our hosts. 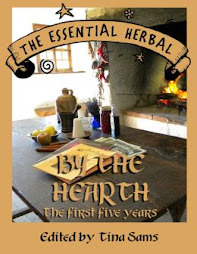 I'm hoping that he'll provide the readers of The Essential Herbal with an article on composting this spring! It is always a special day when we get a visit from a friend from far away. This summer has been full, with lots of good friends coming into the area for all of the cool stuff we have going on - and then stopping to visit us! Karen Mallinger of AllGoodeGifts.com does a yearly vacation with her sisters. The women are flung all across the country (Michigan, Florida, and Ohio! ), and so they take turns choosing a destination and then spend a week together. This year was Lisa's year, and she chose Gettysburg. I was teasing Karen about her on-line picture, and now I think this shot should be her public shot - don't you? Saucy and adventurous - that's Karen. Karen's sister Stephanie is just as hilarious as Karen. These two would be seriously scary on a trip across country. Lisa is more quiet, and seems to just be amused, taking it all in. Anyhow, here is Steph after buying a bunch of Maryanne's lampworked jewelry. Lisa is behind her chuckling, while Steph explains each piece she purchased, and why. Next we wandered down into the woods to see if we could compare notes on some woodland plants. We are from such different areas that things like common names, varieties, etc., can be interesting to compare. We found a log full of these beauties. My brother-in-law id'd them yesterday, and other than being pretty, they are not edible, nor medicinal. I'll probably dry them anyway, and use them in my wild wanderings potpourri. That is just my big honking jar of stuff I find while out. Usually there is some attachment - a place, the people I was walking with - and the jar is filled with so many walks and memories. We went over to the Tilted Kilt for lunch. Having friends in from afar is a GREAT excuse to go back. I think this was probably the last chance we'll get this year to have lunch on the deck, so we took advantage of it, even though it was a mite cool. Karen, Maryanne, and Lisa chat below. Next, we hopped over to Cloverleaf Herb Farm (see blog on blogroll>>>). Kathy Musser came out to chat and we looked over her goodies and did some sniffing and heavy duty browsing. We even found a book that I'd recommended to Steph earlier right there on the shelf (next to Under the Sun, of course). Off they went into the sunset. The next day, the Cyclorama in Gettysburg was set to open and Lisa is a major fan of pretty much any place a cannon has ever been.